"There needs to be a balance between exploiting nano- technology for economic benefits and sufficiently monitoring the social impact." What are the critical issues for policy makers and society emerging from the nanotechnology revolution? 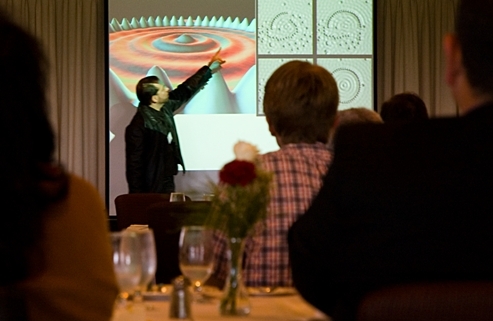 To explore this and other questions, plan to join the Nanoscience and Society Research Group of the Science, Technology and Society Initiative at its first annual international workshop on May 17, 2007 at UMass Amherst. The workshop, "Nanotechnology and Society: The Organization and Policy of Innovation," features a set of high-level invited experts from throughout the United States and Europe including researchers and policy makers from the University of Surrey (UK), the University of Wisconsin, the National Institutes of Health, the Woodrow Wilson International Center for Scholars, and the UMass Amherst Foundation. Topics: The key topics to be addressed at this one-day workshop range from the organization and economics of nanotechnology research and development; the role of media in forming public opinion and policy; technological innovation and dispute resolution; to visual perception of nanoscale phenomena. A nanometer is one-billionth of a meter; DNA is 2 ½ nanometers in diameter. This workshop aims to communicate and advance the growing scholarly literature on the societal implications of nanotechnology, identify potential multidisciplinary research questions and opportunities for partnership as well as build a foundation for mutual communication and collaboration among scientists, engineers, and policy makers. Who should attend: The workshop and discussions are designed primarily for leaders drawn from government, universities, business, and nonprofits: scholars interested in the public policy implications of this emerging technology sector, local and state officials responsible for technology innovation and regulation, firms interested in public and regulatory response to this emerging technology sector, and students in such areas as public policy and administration, communication, law, business, and science and technology studies. Hosts and Support: The STS Nanoscience and Society Research Group, a multi-disciplinary team of faculty from throughout the College of Social and Behavioral Sciences, is part of a $16 million award from the National Science Foundation (grant number 0531171) and a $7 million investment by the University and the Commonwealth of Massachusetts in research on nanoscience and technology at UMass Amherst. The workshop is also supported by a Research Leadership in Action (RLA) Grant from UMass Amherst's vice provost for research. The STS Initiative is based at the Center for Public Policy and Administration.